Pilot Lights go out for several reasons, but with winter coming quickly many of you will find that over the cooling season, the Pilot Light on your Gas Furnace has either gone out naturally, or you shut it off after the last time your heater was used, and it has to be relit in order to get the burners putting some heat into your home! While the use of standing pilot lights is truly on the way out of use and most of the newer systems use a solid state electronic ignition model, there are still several units that are less than 10 years old, that use the older gas pilot light method of firing off the burners. Most systems that do use a pilot system, have a thermocouple installed that senses the heat from the pilot flame, thus allowing the gas valve itself to remain open far enough to keep it lit. When the pilot goes out, the thermocouple automatically sends a signal to the valve and shuts the gas down completely, to prevent gas from escaping into your living area. 1 – Make sure your unit is turned off completely, and the thermostat is NOT calling for heat! While it should not automatically open the gas valve, there is no need to take any chances! 2 – Open the side cover of your furnace and locate the gas valve. You can usually spot it quickly, by following your copper gas line from the shut off valve into the furnace. 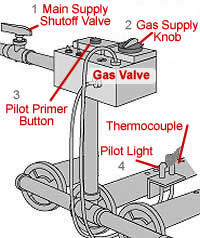 3 – Locate the knob on the gas valve that usually states: On – Off – Pilot, and turn it off for 1 full minute. After the minute passes, turn it to the pilot setting. 4 – Press the primer button for lighting the pilot and hold the flame of a long match or long stem lighter at the tip of the pilot orifice. After the pilot lights, continue depressing the pilot button for 45 seconds to one full minute. This will allow the thermocouple ample time to heat up and keep the pilot lit! What if it the Pilot Will Not Light? If you release the button after 1 full minute and the pilot does not stay lit, you may need a replacement thermocouple or there could be a series of other problems causing it to go out. Repeat the steps above one more time to see if it will stay lit. If the issue continues and it will not remain lit, you should call out a local service company to check the other components of your furnace. In most cases, the problem is narrowed down to the thermocouple, but you cannot know for sure without having a professional evaluate your unit. 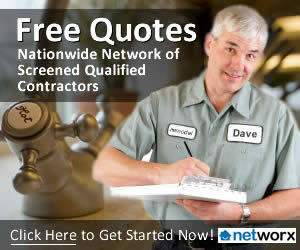 To find the best HVAC contractors in your area, we suggest trying a network like QualitySmith , and taking a few minutes to read the reviews of people just like yourself, to find the most qualified and honest contractors in your area. Do you offer a resource for homeowners to Light their own Pilot lights? If so, please comment below. Its nice to know some basic steps in lighting my own pilot, atleast I won’t be easily fooled by a hvac contractor once I hire one soon. Used your site this AM as our heating went off and I had an issue restarting Pilot light. Your site helped me fix the issue which was the Thermocouple. Working great now. Gotta love $9 fix. Ahahahaha. Thanks. Glad it worked out for you! 🙂 Thanks. Thank you for your wonderful guide on how to light a furnace pilot! I’m very ill and the landlord is of no use. Thanks to use I won’t be freezing tonight! So great! Just lit my pilot light and now I don’t have to wait until December for the gas man to show up. Thanks!